Today’s Last Chance/First Chance Contest represents the final opportunity for players to qualify or add a second entry for this weekend’s 18th Daily Racing Form/NTRA NHC Presented by Racetrack Television Network and Treasure Island Las Vegas. The NHC eve fixture, hosted by Treasure Island, attracted a record 295 entries. Of those, 242 entries are competing for 10 spots in NHC 18, while 55 “double qualifiers” already holding the maximum two entries for this weekend are instead playing for three entries available to the 2018 NHC. The Last Chance/First Chance Contest included races from Aqueduct, Fair Grounds, Gulfstream and Oaklawn. Full results will be available later today on NTRA.com and the NTRA Twitter feed @NTRA. 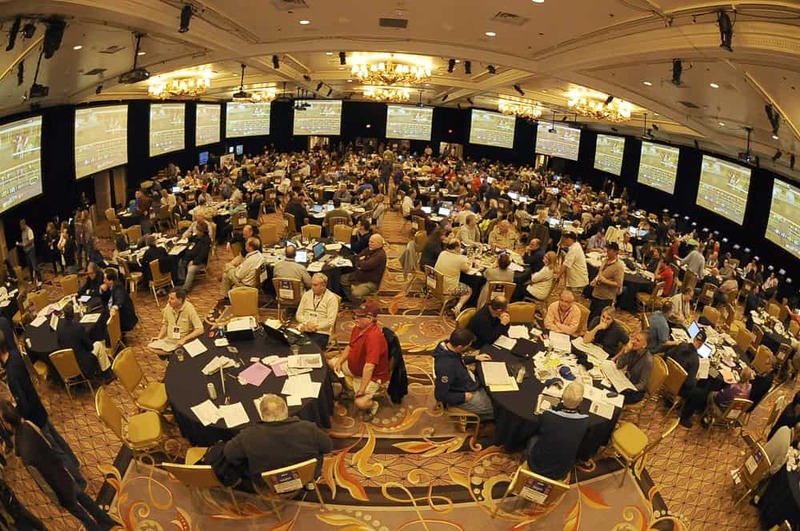 APPELBAUM DECLARES ENTRY 2 FOR $3 MILLION – The Breeders’ Cup Betting Challenge winner Joe Appelbaum holds two entries in the NHC and had to choose one that will be eligible for the new $3 million NHC Tour Bonus should he go on to win this weekend’s contest. In a meeting with tournament officials in front of media and fellow horseplayers this morning, Appelbaum signed a declaration that his second entry – Appelbaum 2 – would be the one with the ability to trigger the bonus. Appelbaum still needs to decide whether the $3 million bonus would be paid in the form of a 40-year annuity at $75,000 per year without interest or as a lump sum of approximately $1,740,000 (based on the approximate present value of the annuity). NHC TOUR CHAMP MCINTYRE AIMING FOR $2 MILLION BONUS – Cheryl McIntyre of Massillon, Ohio, won the 2016 Daily Racing Form NHC Tour is eligible for a $2 million bonus should she go on to win the world’s richest and most prestigious handicapping contest this weekend. The first female NHC Tour winner, McIntyre earned $95,000 ($75,000 for the overall NHC Tour and two $10,000 bonuses, “First Half” and “Second Half,” for being in the top five in separate six-month segments), a trophy, and an automatic berth to NHC 19 in 2018 for her Tour triumph. Defending champion Paul Matties, who received an automatic berth with his 2016 triumph, is not the only former winner returning to the DRF/NTRA National Handicapping Championship. There are eight others that have qualified. The rest of the qualifying champions: John O’Neil (2015), Jose Arias (2014), Jim Benes (2013), Michael Beychok (2012), Richard Goodall (2008), Stanley Bavlish (2007), Stephen Wolfson Jr. (2003), and Judy Wagner (2001). All but the first of nine NHC Tour winners are competing this year. In addition to 2016 NHC Tour winner Cheryl McIntyre (2016), past Tour champions in the field include Jonathon Kinchen (2015), Eric Moomey (2014), Brent Sumja (2013), Mark Streiff (2012), Paul Shurman (2011), Tom Noone (2010), and Bryan Wagner (2009). The inaugural 2008 NHC Tour winner Sam Brooks, of Jarrettsville, Md., did not attempt to qualify and reports that, since retiring, he bought a vacation home in South Carolina and prefers to devote spare time to family. “I’ve gotten away from that but I do miss it,” he said. “Maybe someday I’ll get back into it.” Brooks remains friends with NHC regulars, including Gwyn Houston, a fellow Marylander. Among this year’s NHC contestants willing to disclose their age publicly, the field ranges in life experience from 25-year-old Alex DeVito (b. July 23, 1981), son of repeat NHC qualifier and renowned sports executive Basil DeVito, to 80-year-old Peter Serdarusich (b. March 29, 1936), a repeat qualifier. The old school is also represented by the most senior female qualifier, 78-year-old Jacqueline Sukanick (b. August 23, 1938), also a repeat qualifier and mother of horseman and NHC veteran Brent Sumja. As usual, California is the state which the most players call home with 94 individual horseplayers representing the Golden State this year (as of Jan. 23). Second in the parade of states is New York with 55 players, followed by New Jersey (42), Florida and Illinois (26 apiece), Texas (24), Pennsylvania (20), Kentucky and Massachussetts (18 apiece), and Ohio (17). Canada is represented by 27 handicappers, with Ontario leading all provinces with 16 individual players. In all, 42 U.S. states (including Alaska) and five Canadian provinces (Alberta, British Columbia, Manitoba, Ontario and Quebec) will be represented at the NHC. FRIDAY MANDATORY RACES ANNOUNCED – Tournament officials released the eight mandatory races for Day 1 of the NHC today at 10 a.m. PT. In chronological order, those races are (all times Pacific): Aqueduct 4, 10:50 a.m.; Tampa Bay 6, 12:26 p.m.; Fair Grounds 4, 12:46 p.m.; Oaklawn 5, 1:19 p.m.; Gulfstream 9, 1:32 p.m.; Oaklawn 8, 2:42 p.m.; Santa Anita 7, 4 p.m.; and Santa Anita 8, 4:30 p.m.
SATURDAY MANDATORY RACES TO BE ANNOUNCED FRIDAY MORNING – The mandatory races for Day 2 of the NHC will be announced Friday at 7 a.m. PT. Players and fans can find the races on NTRA.com and the NTRA Twitter feed, @NTRA, and NHC entrants can pick up a sheet listing the races at the registration desk outside of the Treasure Island ballroom.